This week on “Take Out Theater:” An under-appreciated holiday delight is paired with a dangerously delicious sounding cocktail. Cocktails and Movies has returned for our first holiday edition of #TakeOutTheater, the column where we actively discourage our long standing policy of in-theater viewing for something on DVD that you might have missed or forgotten about. Since we’re in the midst of our “30 Holi-Days of Cocktails and Movies” festival, we’re providing some holiday themed programming that makes for great holiday party or decorating fodder. Since they are a little less familiar to all of you, you might just find yourself sitting down to actually watch these Christmas movies! (As much as we love A Christmas Story, it’s one that you could quote while decorating.) This week’s film is an under watched gem with a well watched lead in charge of the festivities. Robert Downey Jr. IS Iron Man. That’s an undisputed fact, so much that it’s basically all he’s really doing at this point. And who can blame him? He’s being paid so well by Marvel that he’s been able to afford dropping out of such high profile films as Oz: The Great And Powerful, Gravity, Mr. Peabody and Sherman, and Inherent Vice. He basically doesn’t have to do anything else but Marvel movies, with the rare occasion that he steps out to make a Sherlock Holmes movie with Guy Richie. If there were ever a movie to remind us that yes, there is a Robert Downey Jr. that swears and cracks wise and uses words you don’t find in those franchises, it would be the 2005 Film Noir/Comedy Kiss Kiss, Bang Bang. After a botched robbery lands him in an audition for a Hollywood movie, Harry Lockhart (Downey Jr.) finds himself jetting from familiar New York to dangerously unfamiliar Los Angeles. There, he’s teamed up with “Gay” Perry Von Shrike (Kilmer) to learn how to be a detective the Hollywood way. Unfortunately for the unlikely pair of flatfoots, they’re unwillingly drawn into a web of intrigue that involves a corpse, a missing person’s case, and a long out of print detective’s legacy resurfacing in the present day. If Harry plays his cards right, he’ll solve the mystery, get the girl (Monaghan), and come out on top. If he doesn’t… well, people like him come to LA on buses every day. Someone will surely replace him. How anyone could watch Kiss Kiss, Bang Bang and not manage to find themselves laughing at least a handful of times is beyond me, especially if you’re a fan of Shane Black’s original wise cracking detective creation Lethal Weapon. Shane Black excels with certain touches in his films: he can set any film at Christmas and manage to not let the setting override the story at hand, he writes action as well as he does comedy, and he has a knack for jokes involving spotting people of different ethnicities than the celebrities they resemble. (All three of which he was able to display in the more four quadrant audience friendly Iron Man 3.) What’s awesome about Black’s writing abilities is that he’s one of the best purveyors of modern Noir out there, as he both understands the lingo and manages to set it in a modern time without resorting to overly tongue in cheek execution. His references are dated, his dialogue cracks like a whip, and his action flows like champagne at an after hours club. Of course, this means absolutely nothing if you don’t have the people who know how to deliver your witty repartee. Thankfully the trio of Downey Jr., Kilmer, and Monaghan more than fit the bill as the dialogue just fits them all like a glove. Even the supporting cast manages to shine on par with the stars, as Black never wastes a word or a character in his plots. Everyone serves to either move the action or compliment the comedic angle, and everything connects in the end. The skills that made Black a writing wunderkind in the 80’s also served him well in his directorial debut. Clearly in the business long enough to have picked up a thing or two from directors like Richard Donner and John McTiernan, Mr. Black manages to use the tricks of the trade without aping either director’s style too closely. I’ve said it before, and I’ll say it every time I talk about this movie, but Kiss Kiss, Bang Bang was Shane Black’s audition reel for Iron Man 3. 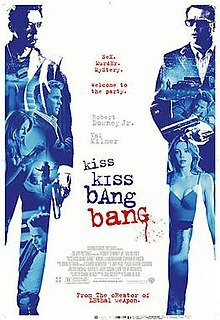 If you liked Iron Man 3‘s tone and humor, and you want to see something similar but with a more adult flare, then Kiss Kiss, Bang Bang is a dead certain entertainment. Thanks again to Lauren Kuhn and Kevin Sweeting over at Crown Publishing for sending us the always awesome Schiller’s Liquor Bar Cocktail Collection. Seriously, if you have any friends that love cocktail manuals, or if you want to give yourself a crash course in bar-tending, head to your favorite book merchant and snag yourself a copy. It’s very affordable, and it’s an awesome thing to have around the house. And, of course, thanks to all of you again for coming for another installment of #TakeOutTheater! We’ll be back next week with another drink on the table and another film on the screen!